In every city you’ll find specialty features, museums and of course, culture. San Diego has all that and more. It offers access to sunny skies 365 days a year. Visiting during the shoulder season provides the least amount of crowds and lessens the financial burden to your wallet. Fresh air, sandy beaches and salty sea air are all free all the time. If you choose wisely, San Diego can definitely be budget friendly. 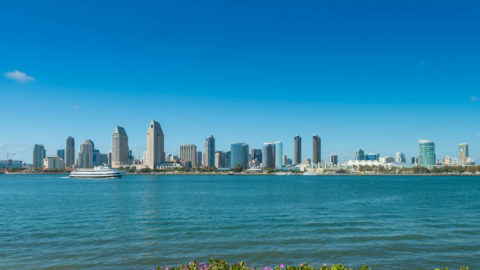 Whether you take advantage of the outdoor lifestyle and hang by the shore, find yourself at a museum in February or choose your own adventure with the Go San Diego card, there are tons of things to do and see in sunny San Diego. Grab a last minute ticket to a Padres game at Petco Park, pick up tickets to catch a game on the ice with the San Diego Gulls or head on down to the Hotel del Coronado in December to catch a glimpse of ice skaters by the beach and take in the fantastic holiday lights display at the famous hotel. Balboa Park: Between the cobblestone artist area of the Spanish village, buskers and food trucks in the Prado, free concerts at Spreckels Organ Pavilion and a constant supply of activities, international houses, hiking trails, food kiosks, coffee carts, flowers, green spaces and gorgeous trees, Balboa Park’s city central green space is a gorgeous spot to wile away the hours. Beaches: Whether you’re taking in the cliff views of Del Mar or the flyovers at Coronado, the sunsets at Mission Beach or the fish tacos at Pacific Beach, the state beach in Carlsbad or the views from Solana Beach, San Diego’s sun, sand and surf will never disappoint. Sunset Cliffs Natural Park: A favorite for engagement spots, picnics, sunset and surfer watching, Point Loma’s Sunset Cliffs Natural Park is open and inviting to all. From the top of the sand-covered rocks, the horizon seems endless and the surf welcoming. Farmers’ Markets: On any given day, you can find a farmers’ market available. Grab your favorite green juice, try your first sea urchin or ogle the organic produce while chatting with grocers and local farmers. The city’s largest farmers’ market takes place on the streets of Little Italy every Saturday. People watch at Ocean Beach Pier: Amateur and expert surfers ride the waves nearby to Ocean Beach pier daily. On the topside you’ll find endless views of crashing waves, impeccable sunset views and people of all ages and walks of life coming down to the sea to enjoy the view. Sunset watch at the three-mile scenic Mission Beach Boardwalk: Whether you’re wandering the boardwalk for exercise, taking in a nearby game of beach volleyball, grabbing some cotton candy at nearby Belmont Park or enjoying the view from the sand, the sunsets off of Mission Beach boardwalk are filled with color and the endless glow from the horizon. Check out the shipwreck below and aircrafts overhead in Coronado: Unearthed by a few heavy storms, the shipwreck at Coronado can be seen at very low tides. Check the tidal flow before heading down to the sand and you’re bound to catch a glimpse of the shipwreck. Look up or listen as the aircrafts from North Island Naval Air Station take off and land at all hours of the day. Visit Sand Castle Man in front of Coronado’s Hotel Del Coronado: Most days of the week you’ll find him on the beach directly in front of the Hotel del Coronado. You’ll see his majestic creations before you find him seated under an umbrella nearby or touching up the castles for your perfect picture taking pleasure. Seal watching at La Jolla Cove: At the center of La Jolla Cove lies a seal colony. Known to villagers, locals and travelers alike, these seals enjoy their life, sun on the beaches, jump in the waves and often take pleasure in strutting their stuff for on-looker’s cameras. Get your learning on at Old Town San Diego: Considered San Diego’s first mission, this state park is filled with informal education like the first school house and candle-making lessons, and contains endless culture with a few museums, native shops and a plethora of eateries from the center of town outward. Check out the theater, try on period clothing and grab an ice cream as you find yourself journeying back through time. Stargaze outside the Fleet Science Center in Balboa Park on the first Wednesday of every month (courtesy of San Diego Astronomy Association): Grab your budding astronomers and head outside to find the details of those glittery sparkles in the sky. Fly a kite at Mission Bay Park or on the shores of San Diego Bay: Bring your own or visit the kite shops and spend hours of endless enjoyment on the city’s seaside. Take in a free concert at Balboa Park’s Spreckels Organ Pavilion: Throughout the summer season there are countless free concerts of all kinds at the organ pavilion. Bring your picnic or support the local vendors and spend an evening outside under the stars. Take in a San Diego Symphony Pops concert from the boardwalk at the Embarcadero: Bring your lawn chairs, sit on the Embarcadero’s benches, hop in your boat or view from the steps of the Convention Center and listen while the talented musicians serenade the city. The Flying Leatherneck Museum: On the grounds of Marine Corps Air Station (MCAS) Miramar, this museum that showcases military vehicles and aircraft is free and open to the public every Sunday. International Houses of Balboa Park: Open every Sunday, these country specific houses, which are staffed by local volunteers who share the history of the houses, are open for your learning, listening and eating pleasure. Stroll Seaport Village: Along the San Diego Bay you’ll find buskers, food kiosks, restaurants, and shops for your viewing pleasure. At certain times of the year, you’ll even be able to grab those photos with the Easter Bunny and Santa Claus. Wander the shops of the Gaslamp Quarter: The historic Gaslamp Quarter is filled with shops, nightlife spots, restaurants and more. Take a walking tour, talk to locals and look for your favorite tourist finds along the way. Take in the city from the Martin Luther King (MLK) path: Running adjacent to the city’s trolley line, you’ll find the MLK path. Filled with historic quotes of the Civil Right’s activist, the open pathway takes you from one end of the city to the other and has easy entrance and exit points along the way. Hike Torrey Pines (park at the public parking by the beach and walk up the hill): This state reserve north of the city is filled with endless vistas, a gliderport, a lodge, hiking trails and direct access to the Pacific. State park pass holders enter for free. Parking lots are accessible for a nominal fee or wait for a spot in the public parking and get your workout in while you hike your way up to the top and then hike your way back down. Hike Mission Regional Trails: Only a ten minute drive out of the city center, the trails invite all who want to enjoy. Cabrillo National Monument: Take in the documentary, grab a hike along the bay, look for whales (from December through March) or watch the water swirl around you as you dip your toes in the sand. Those with an annual national parks pass get in for free. Go San Diego Card: The discount activities card provides access to entertainment and adventure spots like the San Diego Zoo, Safari Park, SeaWorld, Legoland and more. If you’re hanging in town for a few days and want to take advantage of many parks and fun, interactive activities, this is a great option for discounts. 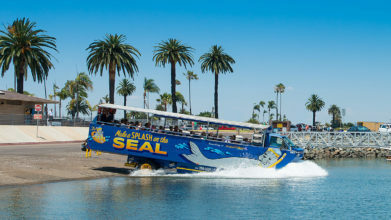 Take a city tour by land or sea on San Diego’s Old Town Trolley Tour and the San Diego SEAL Tour: Complete with history provided by amiable, knowledgeable conductors and guides, both tours provide a narrative of the history and life in the city of San Diego. Get a ticket to sit in the Park for a San Diego Padres Game: The park in the park is a fantastic option for groups, families and pets. Here you’re able to spread out a blanket, pack a picnic and take in the magic of baseball. Take in a game of hockey with the San Diego Gulls or basketball or football with San Diego’s San Diego State University (SDSU) team, the Aztecs: Check out the local minor league ice hockey team or the talents of the collegiate athletes in San Diego. Balboa Park Museum Passport: The best option to visit many museums in Balboa Park is the passport. Since each museum has its own fee, this discounted pass provides access to all participating museums for a full seven days. Museums in February: Each February, Macy’s hosts a Museum Month. Visit any Macy’s spot to pick up your pass and get half off access to all participating museums. This is a great time to visit those museums like the Maritime Museum or the USS Midway that regularly run approximately $20 for one entry.